One of the most important benefits of the quantify-then-identify approach we use in Progenesis LC-MS is that you can find the significantly changing features even when you have no MS/MS data to identify them. Paddy talked about this a few months ago after giving his presentation at the London Biological Mass Spec Discussion Group. 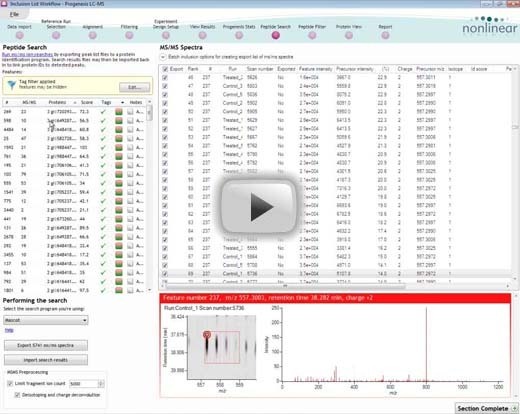 To show how this works when you’re actually using the software, we’ve added a new video to the Progenesis LC-MS section demonstrating the quantify-then-identify approach with targeted inclusion lists. This lets you gather more MS/MS data after quantification of MS1 data, so you have more chance of getting identifications for the features that you’re interested in — even if they were missed previously. Watch the video now, so you can see how this works. You’ll also get a peek at some of the new tagging features coming soon in Progenesis LC-MS v3.0. This entry was written by Wilka Hudson, posted on November 2, 2010 at 11:17 am, filed under November 2010 and tagged Progenesis LC-MS. Bookmark the permalink. Follow any comments here with the RSS feed for this post. Post a comment or leave a trackback: Trackback URL.